This entry was posted on October 21, 2018 at 8:53 pm and is filed under 1980s, Music, Rock, Uncategorized with tags Americans, Classic Rock, hard rock, Heavy Rock, Pat Benatar, progressive rock, soft rock, Starship, The 1980s, top 40, Tropico. You can follow any responses to this entry through the RSS 2.0 feed. You can leave a response, or trackback from your own site. I hated this album when it first came out. It just wasn’t PAT. It took years to grow on me & that was my age. Now, it is grand. Her next album, Seven The Hard Way is my absolute favorite, even tho she hated making it. And, I almost got to see her in concert for that tour but, she canceled it due to her daughter…or her pregnancy…or something. I was so mad. She evolved. I bought a box set with recorded interviews & Spider made a remark about her being more of a soulful blusey artist than a rocker. Some of that was his influence & the times of women taking the spotlight in the late 70s, early 80s. Gravity’s Rainbow was really good, too. Wide Awkward in Dreamland produced “All Fired Up” which sounded boring & forced. I still can’t stand it. 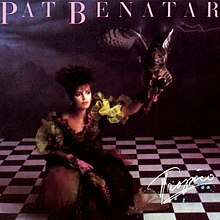 Ditto “Hit Me With Your Best Shot”, the most overplayed Benatar song in history. YUCK. You know, I love so much of her body of work that, I can’t choose a fave song because so many of them reach me in a different way. Seven The Hard Way is my fave only because, percentage-wise, it has the most songs on one album that I like. My two fave songs that capture her high range the best are “Wuthering Heights” & “Legend of Billie Jean”. She could shatter glass. She could because she has such an amazing voice. As far as my favourite PB album, it’s a toss up between the second and third albums. Y’know, I still haven’t ever heard a Benatar album. I like the sound of this one, though… great write-up. Thanks, this is a good one but I still prefer the first four.